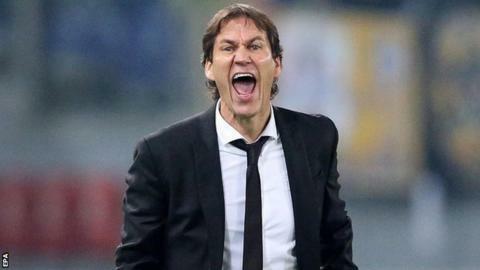 Roma boss Rudi Garcia says his players have to show more spirit after brushing off speculation about his own job. The Frenchman, who was appointed in June 2013, has seen his side win one of their last seven Serie A games after Saturday's 1-1 draw with AC Milan. Roma's players left the pitch to boos from home fans at the Stadio Olimpico. "Other names being touted for my job is the least of my concerns," said Garcia, whose side were five points behind the leaders after Saturday's results. "All that I worry about is improving the team. We have to help ourselves. We won't start improving until we show more spirit." The former Lille boss added: "The only way past this is through hard work and asking the right questions to improve. "We are only at the halfway stage of the season. "I am not pleased with our performance. We need to be more consistent over 90 minutes, else you can't win games."